We love great live music. We don’t love going to see shows at venues with bad sound, high volume, and noisy, rude audiences. Our house concerts have the opposite: great sound, reasonable volume, and fun, attentive audiences. We have about 6 house concerts per year. Most of the artists who have performed fall somewhere in the Americana spectrum. Our tastes are more diverse and we are looking to host a wider variety of artists. We often like hard to describe music that bridges multiple genres. Favorites include Buddy Miller, Kevin Welch, Brigitte DeMeyer, John Hiatt, brown bird, Etta James, the David Wax Museum, Gillian Welch, Willie Mason, Mulatu Astatke, gypsy jazz, and the Art Ensemble of Chicago. We like lively music with a bounce to it, not gentle, nod inducing singer-songwriters. The life of the touring musician is tough, especially when they go to cities where they haven’t established a fan base. That is why we prefer to host shows for musicians from outside of Northeast Ohio. This also lets us introduce Cleveland audiences to great musicians they may not have heard before. As you may have guessed, the shows are at our home, which is a large 100-year-old diamond-in-the-rough. It has lovely woodwork, cool leaded glass, an old mural, and – most importantly – great acoustics. It also houses 3 dogs and a cat. It’s in Cleveland’s Ohio City neighborhood, close to I-90 and many great restaurants. Mechanic Street House Concerts isn't a business. We don't make any money from these private, invitation only events. A donation is requested, 100% of which goes to the artists who have spent a lifetime of hard work honing their skills to provide the best possible entertainment for their audience. 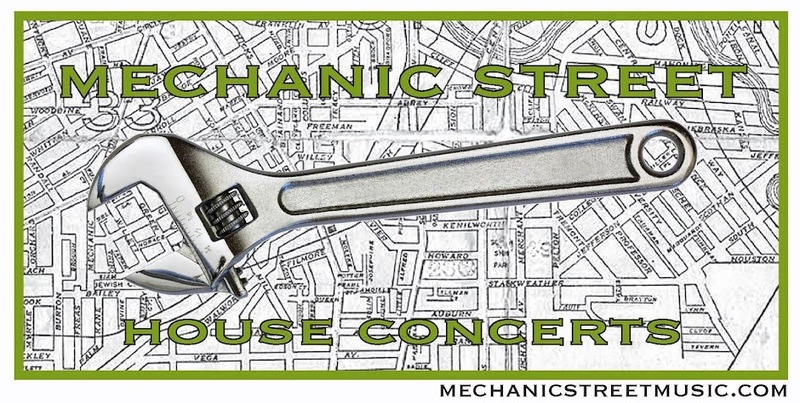 Its called Mechanic Street House Concerts because the street we live on used to be called Mechanic Street and we thought it had a nice ring to it. Please sign up for our mailing list above on the right and we’ll keep you posted on upcoming house concerts. For anything else, please email us at mechanicstreetmusic@yahoo.com. We hope you can join us for a show!